Earlier this year, I tried baking some Macarons which turned out pretty good; but, I felt there was room for improvement. Hence, recently I had another go at it, made them with different flavors as well this time. They turned out great this time, I thought. I had adapted all the recipes from Cannelle et Vanille. I discovered her beautiful Macarons pictures through Tastespotting and Foodgawker. The Macarons were very good; but, still a tad too sweet for me I have to admit. However, my kids thought they were just right and loved it. 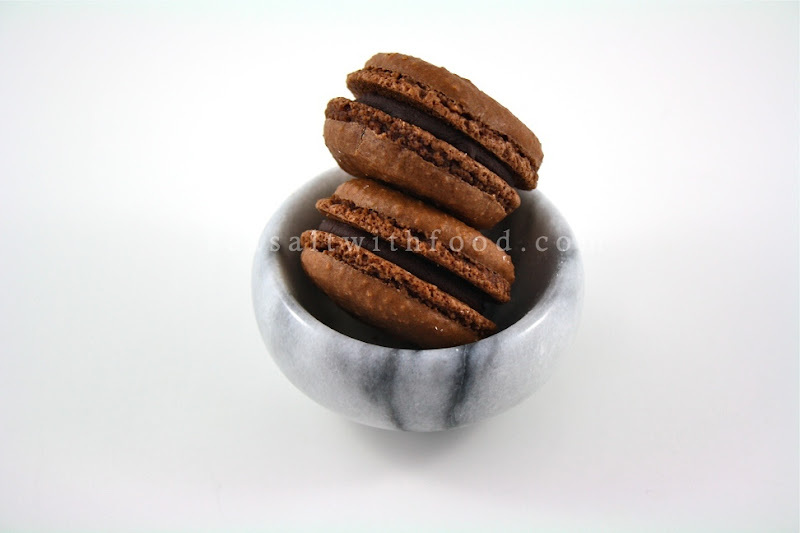 Today I am posting a recipe for Chocolate Macarons. I will post the recipes for another two different flavors next week. Whip the egg whites and the lemon juice until they are almost fully whipped. Sprinkle in the sugar while still mixing. Continue to whip to a full meringue. Sift the powdered sugar, salt, almond flour and cocoa powder into a bowl. Add the meringue into the dry ingredients and fold until a shiny mass is formed. Fit a piping bag with a 3/8-inch (1 cm) round tip. Pipe the batter onto the baking sheet with parchment paper. Let dry at room temperature for 1 or 2 hours to allow skins to form. Remove macarons from the oven and transfer the parchment paper to a cooling rack. 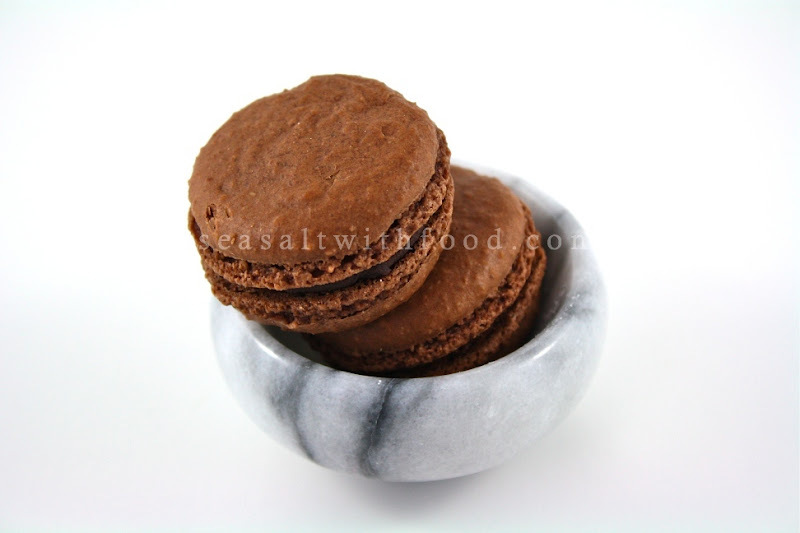 When cool, slide a metal offset spatula or pairing knife underneath the macaron to remove from parchment. Pair macarons of similar size, and pipe about 1/2 tsp of the filling onto one of the macarons. 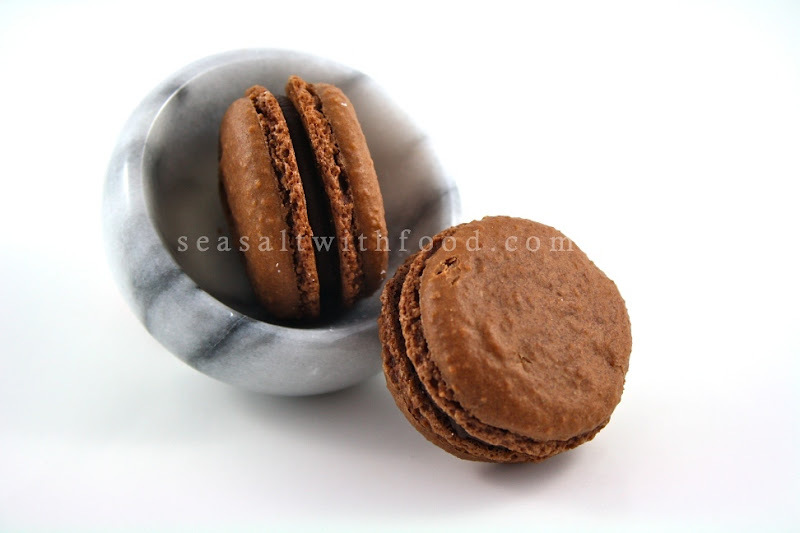 Sandwich macarons, and refrigerate to allow flavors to blend together. Bring back to room temperature before serving. Your macaroons look awesome and they've got feet! What adorable feet :) Such a yummy and delicious treat!